I was blog surfing awhile back and I came across a Lynne Demeter's Blog . She had made a Door Topper that I really liked. So I left a comment saying how much I liked it. Lynne e-mailed me and offered to send me a pattern. The pattern was in Quilter's Newsletter Magazine in 2003. The designer is Patrick Lose from "At Home" with Patrick Lose. I received the pattern last week. Thank you so very much Lynne!! I tell you quilters are the kindest most generous folks I've ever met. (I wish Real Estate Agents and Sports Car dealers were as kind to me.) I really like how it adds some fun over a door. The picture is of Lynne's door....not mine!!! I'm not that fast. You are now the "Spanky Name Badge Designer here at I Have A Notion." Janice you have bragging rights and can clear out some space in your sewing area for all your Amy Butler gifts!!! Thank you to everyone who entered the contest. I certainly appreciated all the creativity and energy that went into your efforts!!! This is Jen Barlett from Accuquilt was at Checker's Open House. She demonstrated how to use the Accuquilt Go and answered questions. You can put up to 6 layers of 100% cotton fabric onto the die to cut your shapes all at one time. To see the video of how it works click here. Here are 6 circles Jen made. When Jen was demonstrating I noticed the handle looked tight to turn. I asked if I could try turning the handle to see for myself how difficult it was to turn. It was tight and I had to put forth some effort. I was cutting through 6 layers of fabric so it would be tighter to turn than just one layer. I asked Jen if she has wrist problems and she said no. I don't have wrist problems either. I wanted to see someone with wrist problems turn the handle and tell me what their experience was. I asked several people if they had wrist problems and Mick Miller, Patches of Sunshine, happened to be standing near. He said he has had carpel tunnel syndrome and he has not had one problem with his Accuquilt machine. He explained it is the way the wrist works that his motion is easier than using a rotary cutter. I know many people have difficulty using a rotary cutter due to disabilities and injuries and I can see how helpful this may be for them as well. I think this is a great tool if you want to make lots of cuts at one time. There are several dies to choose from. The most popular is the 2 inch strip. You can click on their link to see all the dies available. Just by chance, IHAN also carries the Accuquilt Go....hop right over HERE and get yourself a dozen...they would make great gifts...after all I offer Free Shipping!!! I have heard some folks complain about the Accuquilt Go and it's accuracy when cutting. I asked Jen what she had to say about those comments. She said it does depend on the warp and weft of the fabric. They offer a TIPS sheet and to view the TIPS click this here little ole word....TIPS. We stacked up 6 layers of fabric and we cut some fabric. In the picture above you can see the little bit that the fabric fabric is off at the top. I asked her if it was how I was lining up the fabric or was it the die cutting inaccurately. It happened on three of the pieces we cut. You can see the tiny bit it was off. They were off a tiny bit. As I stood there I was thinking to myself....hmmmm...I know I have cut several blocks the exact same size with the exact same rotary cutter and ruler and all my blocks were not exact. People have been cutting quilts for years using scissors alone and theirs were no perfect. The quilts still come out looking beautiful. I personally think it is the accuracy of the layering. If you cut them one at a time...they would probably be perfect each time. But when you are cutting 6 layers you might study the Tips so you can get the grain of the fabric correct if you want every one to be exact. Either way, you're still going to have to square up your quilt when you are done....exact perfect cuts or not, right? These circles were all exactly the same. Here I re-cut the triangle making sure I had the fabric over the die and it did come out perfect. So again, I think it does exactly what it advertises that it does. However, you need to learn how to use the machine and learn how to line up your fabric. After all, you don't buy a sewing machine and plug it in and start sewing. You have to learn about inserting the needle, threading the machine, adjust tension....etc. I'm truly not trying to "sell" you one of these machines. I just want you to know what my experience was and what I learned. It's like I'm taking you around in my pocket and you are hearing my thoughts. Now that is really a frightening thought ay? Zachary starts school tomorrow morning. Mrs. Gillmore, Kindergarten Teacher, has no clue as to what she is in for. I told her last week when we went to see his classroom that if she called me crying I would not come and get him. She laughed. She won't be laughing by Friday!!! Yes I am stretching reality a bit.....but he is the most determined child I've ever met in my life. I honestly am looking forward both of them getting on the bus tomorrow. Can anyone relate? I think I just heard a loud Amen from the back row....guess others have had the same experience ay? I'll be thrilled at 3:50 to see those little faces getting off the bus too. The fish fabric is what I won in a gave away earlier this week. I used it as the back of the blanket and folded it up so you could see the back too. I love fish and these bright colors were just perfect. You know there is a story here....there is ALWAYS a story. I found the little frog at a garage sale for 50cents. It was a little purse but I just loved the frog. So when I was looking through my fabrics to see what I was going to make I came across this frog. Bingo! / Loteria! So I cut off the little black cord (no I did not throw the strap away....I knew you would ask me that) and gave him some eyes. Zach's is attached to his "illow casey." I took the top of one intact "illow casey" and sewed it into the frogs mouth. When you unzip the frog's mouth....it's tongue is "illow casey." During quiet time he can have a little security if he wants it. To make the letters I typed them out on my computer and held a blank piece of paper up to the screen. I then copied them onto freezer paper. If I were smarter I would have held up freezer paper to the computer screen. Hindsight is 20/20. I pressed the freezer paper onto fabric and Rick was kind enough to cut them out for me. I pressed the letters onto the blue fabric and began to zig zag around the letters. I could not believe how nice the zig zag was coming out. I've never had it come out this good, ever!! I was wondering why this time are the stitches so nice. I know it was not the setting because I've used the same setting before. Then I looked down and saw I was wearing my Grab-A-Roos. I guess it was an accident that I learned what I was doing differently. The fabric was thick and difficult to move while I was stitching. I put on my Grab-A-Roos because they have rubber nubs on them and that made it easier to hold my fabric. I did not realize this before but I must have been pulling my fabric through the machine and not letting the machine move the fabric. With the Grab-A-Roos I did not have to hold the fabric so tightly. I did not pull it through....I just guided it. How cool is that? Nice even stitches. Well don't I just feel like a smartie pants tonight? Your darn toot'n I do!!! I figured out something all by myself...wait until I tell MJ and Lois. I can see them rolling their eyes now. Art Garabedian, from Reliable Corp., was also at the Checker Open House. Art brought an ironing board, three irons and a light to demonstrate. I think it was very kind of Art to bring new toys for me to play with. I did ask permission before I started picking up everything and testing them. I bet he'll say No when I ask next time. I spent way too much time testing the irons and the light. I think I pulled and shifted the neck of the light expecting it would break (secretly wanting to know how easily it would break....I'm so glad it didn't....saves me being embarrassed and I'm excited about this light so now I know it is worth it). Yes the crazy red head is at it again and this time, she's packing heat!!! I did not take a good photo of the entire ironing board because I'm always trying to get the pix that I think you might want to see so you feel like you were there with me. This is the front of the ironing board under the cover. Usual shape. This ironing board comes with an attachment that just slips onto the ironing board to make it rectangular. So it is great for ironing quilts/larger cloth. It comes with 2 covers. Click on the link to see all the specs. I liked the heat resistant cloth that is on the end of the cover. You can leave your iron down and not burn the cover. I also liked the iron station beneath the table. It will hold the Iron Maven!!! Woo Hooodley Doodley....this baby packs some serious steam. It weighs 4 lbs (Art said standard weight for an iron is 4lbs (I did not ask how many Oreo's that is). This is the base and it has a removable water container. The iron still works even when you take out the container....cool ay? There are so many features....click on the link and read the specs....you won't be sorry you did. An iron who understands and is an expert in a particular field. OK...I guess....but why not hire me to give your products names? I would have called it, "Iron Jane." Guess Iron Jane does not sound as cool as Iron Maven. What about Iron Kelly....alright already....I'll stop. I spent most of my time checking out this iron. It has new technology so the iron can't leak water onto your cloth. The heat on the sole plate is evenly distributed and you can adjust that temperature. It produces more steam than a regular household iron. Click on the link to read the specs. I really wadded this fabric in my hand and held it for several minutes. This is the back after I ironed it. This is the front after I ironed it. Being the Smart Booty/Maven I am....I held it under the Uber LED light afterwards. I can see little wrinkles in the cotton. The other ladies around me were sold and were carting off irons right and left. Not me....nope. I wanted to see if that iron would get rid of every wrinkle no mater how small. It did a very good job. Art kept looking at me....I bet he was wondering what on GGE was it going to take to make me happy. Then he asked what I wanted it to do....I said I want crisp wrinkle free cloth like the dry cleaner gives you. To get professional (dry cleaner type) crispness, Art said I would need a Vacuum Board. I had never heard of a vacuum board before Monday. Sure enough....what gives your clothes/cloth the crispness is the vacuum in the ironing boards that removes all moisture from the cloth. Makes perfect sense now. When you introduce steam....which is moisture.....you need to remove all the moisture to get the crisp finish. Now your talking baby!!! I want the Iron Maven and the Vacuum Board. I asked Art to bring one to Quilt Market so I could try it out. I would definitely spend my money on something like that if I knew my husband could iron his shirts that crisp. Notice I did not say I could iron his shirts? I love the crip wrink free look of fabric and cloth. You think it will remove my wrinkles too? This light is really, really, really nice. I'm not kidding you. I bent this baby every which way and it still held up strong. I was very impressed with the 26 inch neck on this light. It was really made well. This neck won't flop over like those other lights do. It is top notch!! It has 28 LED's which will last 60,000 hours. That translates to 6.85 years if you left it on continuously. Guess we'll be passing these babies on to our kids. For those of you who are lazy and never turn off your lights....you better buy several...and you know from where....right here. The c-clamp opens 1.8 inches. It is made of commercial grade steel so it was built to last. Before buying one you might want to consider all the places you might use it....measure the width you would need to be sure the 1.8 inches is appropriate. I think this would make an EXCELLENT holiday gift. Thanks for hanging in there with me. Sorry it takes me so long to say a few things. I'm guessing that is what I have to offer than other stores don't....an honest opinion from someone who has made sure the product does what it is advertised to do. How would you like to win a quilt top? 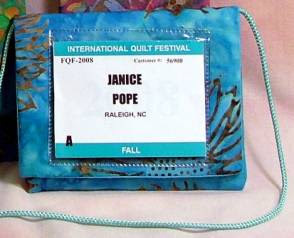 You and me both :) Head over to Barb's blog, Bejeweled Quilts by Barb and check out her giveaway. I love those fabrics....I love fish and those look yummy. that I need for fall. it....I'm never short for words. Lets just say it has opened my world and my heart. So, to hold up my end of the bargain....here are The Photos. Revealing aren't they? I think this is as much skin as most readers can tolerate. Anyone wanting to see more skin....I've heard there are magazines for people like you. I promised to put everyone who advertised this challenge on their blog or e-mailed 5 friends an opportunity to win 4 MJE Bag Tags. I put all the names in a hat and pulled out John Adams (Quilt Dad). If you have not visited his blog....you are missing out. Click on his name and you'll be magically delivered to his blog. A special thanks to Khris (SewPrimKhris). Her blog is way too much fun....and you guessed it you clever devil....click on her name and wah....lahhh....you will be sitting smack dab in the middle of her blog :) Khris taught me to put the buttons on my blog for both the Roc-Lon Challenge and the Amy Butler Challenge. Khris Rocks!!! Orion asked me if I had the rulers below. I told him no but I'd like to learn how they work. As many of you know, I learn best by physical demonstration followed by verbal direction. Orion was very patient and showed me every step in the process. I took photos so you could follow along too. Orion put an 11 inch piece of fabric down and then a 9 1/2 inch piece on top of the larger one. Next you sew 1/4 inch on either side of the line. Cut on the line. Press towards the large triangle on both pieces. With right sides together and the opposite fabrics facing one another, you line up the outer edges of the fabric. The angles won't match up as shown below. Draw another line and stitch across. A Clean House in Two Hours? More Fun at I Have A Notion? Roc-lon Contest..... Are You In? My First Quilt "Many Hands"